Fear is thinking what I’m doing doesn’t matter, faith is me believing it matters and doing it. Fear is believing no one cares, faith is believing that at least one person does. Fear is believing that I don’t make a difference, faith is believing that at least one person is getting something from my writing. Fear is not publishing my new book because what if it isn’t good enough & people don’t like it, faith is publishing it anyway. Fear is believing there won’t be enough for me, faith is believing in abundance & enough for everybody including me. Fear is not trying new things because what if people don’t like them, faith is doing new things because I like them. Fear is not following the purpose of my life, faith is writing every day. Fear is rejection, faith is putting myself out in the world. Fear is the snarky question: Just who do you think you are?, faith is the quiet answer: a writer & an artist. Fear is backing down and staying in the shadows, faith is rising up and shining my light. Fear is thinking it’s a stupid idea, faith is believing it’s worth trying. Fear is failing & allowing that voice: I told you so, faith is picking myself back up and trying again. Fear is believing in failure, faith is believing in lessons learned. Fear is not saying what I need to say, faith is speaking the truth. Fear is being given a gift/talent & not using it, faith is operating in my gifts/talents every day. Fear is worrying about what everyone else is doing, faith is being concerned only with what I’m doing. Fear is writing for other people, faith is writing for myself. Fear is believing it’s too late, faith is believing my time is coming. Fear is trying to rush & push things through, faith is trusting the process. Fear is knowing the right next thing to do & not doing it, faith is knowing the right next thing to do & doing it. Fear says don’t share something so personal because people will think badly of you, faith says be authentic because someone somewhere probably needs to hear it. 6 Responses to "One Wild Life ~ Choose Faith, Not Fear"
Hi, Shelli. I’m telling you, this is the “faith” place. I especially love that last line about being authentic because someone out there probably needs to hear it. Perhaps I’m just too romantic. You’d think in a business that’s about selling fiction that no one would be talking about keeping anything real, but it’s just the opposite, isn’t it? It is for me anyway. Sounds like it is for you as well. Hi Jimmy! *high-five* <==awesome! You rock, sir. Thanks for the fab compliment ("faith place") as it made me smile this afternoon. 🙂 You know, even with fiction, IMO, the only way you really connect with a reader is by being authentic and writing in your own voice. Those are the stories that stick with you (well, at least for me) long after you've closed the book. You are welcome for the refreshing drink, anytime. 😀 Cheers, my friend. In my neck of the woods people automatically associate faith with religion. But the kind of faith you describe is the faith that I believe in. Having faith in yourself is one of the greatest gifts you can bestow. 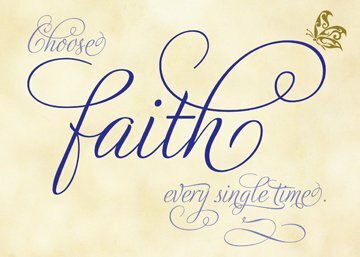 I think a lot (maybe even most) people associate faith with religion. But that’s not the only kind of faith as you said so beautifully: “Having faith in yourself is one of the greatest gifts you can bestow.” Absolutely true. Cheers, darlin. An inspiring post. I can relate to so many of the fears you listed. And am always working on having more faith. Faith is letting go of fear and believing in yourself. Thanks so much for the fab compliment. Made me smile. 🙂 You’re absolutely right that faith is about letting go of fear & believing in your self. Cheers, darlin.